When you’re leading a project, part of what you’re doing is working with stakeholders who hired you to get that work done they way they want it. PM trainer Susanne Madsen knows they can often be a handful, so she offers you some practical tips in how to deal with difficult stakeholders. It’s a bit different dealing with difficulty when it’s coming from a place of authority rather than dealing with team members who are difficult that are under your command. But it all comes down to mindful understanding and careful communications, which is how you lead a team and even those in authority over you. Pro-Tip: Basically, Susanne shows how to lead when you don’t have authority, and leadership expert expands on those techniques with his article 10 Ways to Influence Without Authority. You can’t have enough arrows in your quiver when it comes to persuasive methods. Hi, I’m Susanne Madsen. 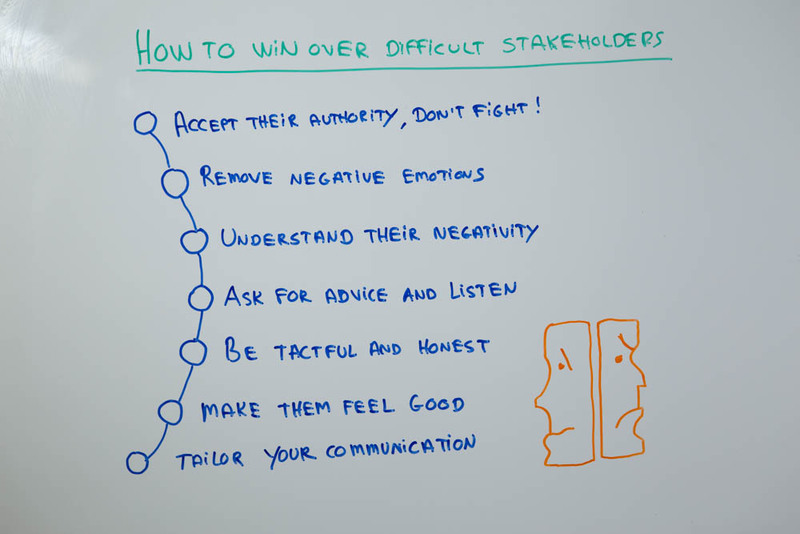 Welcome to this whiteboard session on How To Win Over Difficult Stakeholders. You may have some of those in your project, stakeholders who you feel are not really coming to the table. They’re not fully bought-in on the project. You’re not really sure why, but you would like to build better relationships with them and win them over, so that they become more supportive. How can you do that? First of all, you have to accept their authority and don’t fight them. That may be very, very difficult if you feel that you don’t respect them, or maybe you’re not really sure of them. I invite you to look inwards and really examine the feelings you have for these stakeholders. If you walk into a room aiming to build trust with mistrust, you’re not going to get very far. So you have to remove your negative emotions, become conscious of what those emotions are, and put them to one side, however difficult it may be. Accept their position. Then you have to understand the root cause of the negativity. Are they not bought-in because they don’t have time, and it just comes across as being skeptical? Or are they truly not bought-in to the project because they don’t feel that their requirements are being met for the project? Maybe they don’t have a clear role in the project, which makes them sit on the fence. The best way to find out what the root cause of their negativity is, is to ask them for advice. This one is a really big one. I invite you to find some time, one on one with the stakeholder. Sit down with them and ask some open questions. Elicit feedback from them. You could, for instance, ask, “I would like to ask for some feedback about how you feel we could work better together,” or, “What feedback might you have on how we could improve on the project?” They’re very open questions. They work wonders. It may take a bit of courage to ask them, but it’s definitely worth it. What you will get back from your stakeholder is an honest answer that will give you a wealth of information that can tell you how you can repair that relationship, but do not go into defensive mode. Listen to them. Be tactful and honest. You have to say things the way they are. Don’t speak down to people. Be polite, but be honest about what you require them to do on the project. It’s very hard to deliver a successful project without the stakeholders being bought-in. Make them feel good. That always works wonders. Talk about things that they’re generally interested in. Consider what’s in it for them. And finally, tailor your communication. If you know that your stakeholder likes to schedule things, then set up a scheduled meeting. If they’re more informal, take them to a coffee shop. Try to mirror them. Seek to speak to them on their terms.